It’s not enough to set personal goals and objectives, even if they are targeted at what I really want to reach in life. It’s also not enough to set out on our journey based only on our vision. One of the most important things is to understand what I have that will help me succeed and what I should avoid. And that is also not always enough. For most of us, it’s not easy to distinguish between our internal means and obstacles and the external, environmental powers that have potential to help us grow or get in our way. And more so, it’s important to align internal and external forces to help us get things done. This distinction, the ability to see all the pieces of the puzzle and deduce a course of action is what the SWOT tool enables. In fact, with SWOT as a preliminary tool and some agile guidelines, achieving our personal objectives can become quite a simple task. 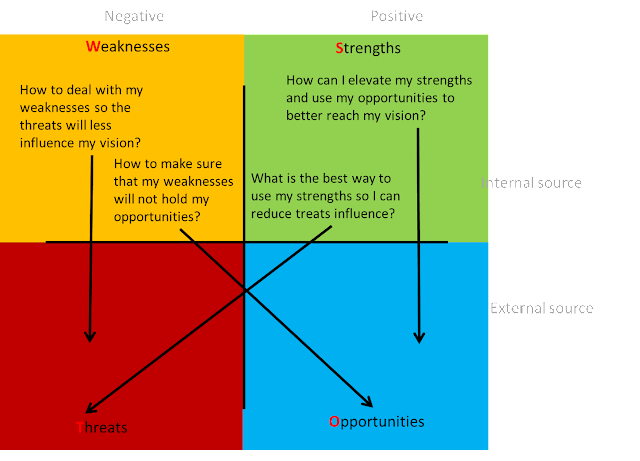 SWOT is another of many tools that lets us discover our strengths and abilities. It is used by organizations around the world to asses strategic decisions, organizational capabilities, possible directions, products and more. 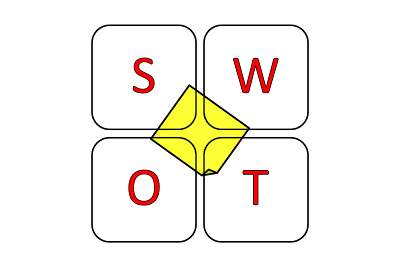 SWOT is not limited for use by business organizations. This wonderful tool can be used on a personal and team level as well. So the benefits of SWOT are that it can take all the factors - internal and external, positive and negative - and use them to help us focus on a realistic plan to achieve our goals. 1. Our initial assumption is that we have a vision or end-goal we want to reach. 3. Understanding: I’ll ask myself questions relating to my end-goal or vision. I’ll write the answers on post-its and stick them in the proper quadrant of my SWOT board. * O: Regarding my vision, what opportunities exist? Is there a specific job opening that just opened up? Political situation? Family? Financial? etc..
* T: regarding my vision, what threats may there be? What will hold me back? Is it starting from lower position? Income? Residents? ** it is recommended that you take those questions and get some feedback from your soundings. Show them your SWOT and ask them what they would say about you regarding these questions. I know it’s its not that easy, but true outside feedback is something very important. It gives a different point of view over the issues at stake for me. And you may be surprise how others see your strengths , weaknesses and how they related to threats that may be different from what you initially thought. **few words on visibility: the probability to get things done increase when I see the things I need to do. When I see it, I can relate to it, I can relate to it more often and it will probably catch my attention more than other things around. If you really want to take SWOT from theory to action, make it visible. leave out the pen and paper and take it to the level where it is visible where you most needs to see it. 4. The analysis: Examine, ask ourselves few questions related to our vision. · Our goal at this stage is to understand how we can use our internal straights toward achieving our vision. · Furthermore, we would like to get the full picture over the situation. · How can I take my straights and take advantage over the opportunities in my journey toward achieving my vision? · What is the best way to use my straights so I can reduce the threat? · How can I make sure, my weaknesses will not hold me back from the opportunities ahead? · How can I reduce the threats and weaknesses so they will less influence me in my journey towards my vision? · How do I use the opportunities, and when? 5. building the most basic building blocks for the journey . · According to what we’ve learned in the previous steps, Create a list of all the tasks, goals you need to do/archive. A good execution may be that we take one or two actions, examine them in our day to day reality and then go back to the SWOT and see if something has changed. 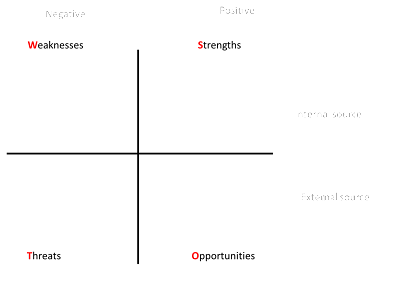 · SWOT as presented here is not a judgmental tool. It is a personal and subjective tool therefore, it is highly important that the SWOT owner will understand his board as it reflects his own subjective reality. · Visibility – Make sure you see what you need to do and where you‘re at. 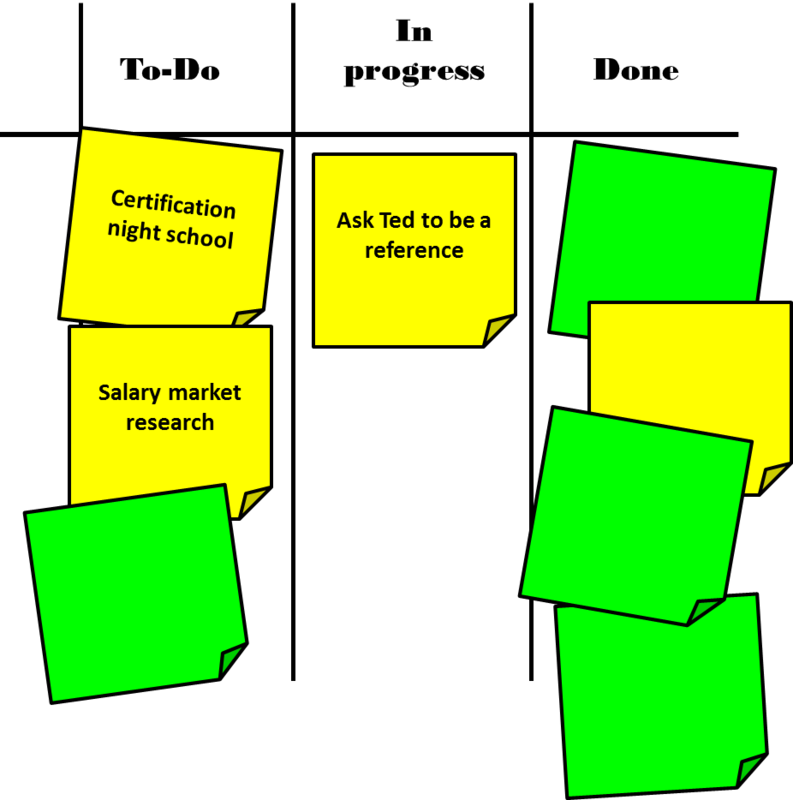 Place the SWOT board in a location where you can relate to it frequently. · Since SWOT is not just a onetime evaluation tool, make sure to revisit your SWOT and change it accordingly. Did I gain some more straights? Do I have new opportunities? Did I eliminate threats? Improvement will happen when we will create the routine of continues change and continues improvement. · Pick your relevant execution actions according to their highest value for you. There is no need to take to action all the SWOT tasks at once. · Start small! Take one step at a time. Sometimes it’s enough to understand something “just enough” and start executing, instead of examining endless options and sides of the same situation. Anyway, the most important feedback will start flowing once you start executing your actions. If you’ve taken to execute an action related to weaknesses or straights, start small. Small tasks are easy to get done, easier to get feedback, has a good impact over the feeling of success and achievement and..if you fail, you fail small. · There are many ways to achieve your goals and vision –SWOT is just one of them. ● Humphrey, Albert (December 2005). "SWOT Analysis for Management Consulting". SRI Alumni Newsletter (SRI International).